The Facebook augmented reality service is being rolled out and is likely to transform the way brands advertise on the platform. During this year’s Facebook Developer Conference, Facebook’s Mark Zuckerberg announced that the giant social media now has Camera Effects Platform, an interactive service that promises to take Facebook Live to a whole new level. The Camera Effects Platform is founded on the Facebook camera introduced late March, 2017. While the Facebook camera is a considered success in making video and photo sharing more interactive and expressive with its new fun filters, masks, fresh guest art and frames; Facebook says the camera was just but the first step toward augmented reality which it believes is a huge part of the future. The company’s chief executive officer Mark Zuckerberg explained the Facebook camera aspects that people have viewed as imitations of features from Snapchat saying that they (Facebook) had to begin with “products that people were familiar with”. He argued that that was the sensible thing to do. According to Mark Zuckerberg, the Facebook camera was just the initial chapter as they are now building the first “mainstream augmented reality platform” which he termed as the unique thing away from basic cameras. With the Camera Effects Platform, the tech giant is making it possible for the entire planet’s creative community to build innovative effects for the Facebook camera to create heightened possibilities for self-expression by its users. On this platform, artists and developers, who are the primary targets of this platform, can connect their art with data to bring augmented reality into everyday life. How the Camera Effects Platform works? This new service uses the Facebook camera to let the Facebook community create a full spectrum of camera effects, from simple frames to interactive AR experiences using its two creative tools: Frame Studio and AR Studio. This is a web-based tool that allows anyone who has a profile or Facebook Page to design frames for use in the Facebook camera or on users’ profile pictures. The frames you create appear in your friend’s or Facebook fans’ cameras. Additionally, the frames feature your name alongside the effect in the camera as well as in the final posts with the frames in News Feed. Facebook has set out specific guidelines on the use of these frames that you need to abide by. Specifically, you cannot include any trademark or logos on the frame unless it has been pre-approved by the tech company. This is an authoring tool for augmented reality experience in beta that is currently available to third party iOS users on invite-only basis. Third party artists and developers can use this tool to create their own experiences in the form of masks, animated frames and a huge variety of interactive effects. Creations on the AR Studio can respond to different external stimuli, including motion, face tracking, third-party data as well as interactions taking place during Facebook Live broadcasts. These creations must be approved by Facebook, after which they can be applied to photos or videos and Live broadcasts that are captured with the Facebook camera. These enable you to access and download data, respond to user interactions and modify the effect in actual time. This is a computer vision algorithm that tracks the face in real-time allowing the creator to make masks that fit and respond to facial movements. These algorithms work without the need for additional coding. These allow you to build various effects where users can move their phones to pan around a virtual world. Facebook is targeting artists and developers with this new camera effects platform. The tech titan has not yet made obvious its plans to monetise the service. But the fact that it’s already working with some key brands as its AR Studio beta partners is indication enough that the service may be brand-centric. While announcing the platform, Facebook mentioned Manchester United, Real Madrid, Electronic Arts, Giphy, Nike, Warner Bros and TripIt as the AR Studio beta partners that have used the platform’s AR Studio to create new engaging camera effects for their communities. This is a telling sign that the social media company is ready to leverage opportunities that brands can provide. Already its Frame Studio is available to everyone with a Facebook page. As a page owner, you should already be able to start experimenting with the new tool to create personal frames taking care not to include trademarks or logos unless you have a prior approval from Facebook. Opportunities that this new platform carries for brands are still unlimited. More specifically, it presents a way to target sections of the market that are specifically drawn to this kind of social interaction. Predictions laid out in these four charts on Bloomberg show significant leaps that are already made and that are expected in AR sales by 2025. As early as 2015, big brands had already jumped into the emergent AR/VR enterprise with major front runners including Nestle and Starbucks. According to Juniper Research, augmented reality is expected to drive $2.4 billion in annual app revenues in 2019. That’s a major leap considering that the figure stood at $247 million in 2014. As of July 2016, mobile users were spending more time on Pokémon Go, a free-to-play augmented reality game than they were spending on Facebook. These stats only serve to reveal how augmented reality can be potentially engaging to a section of the global audience. 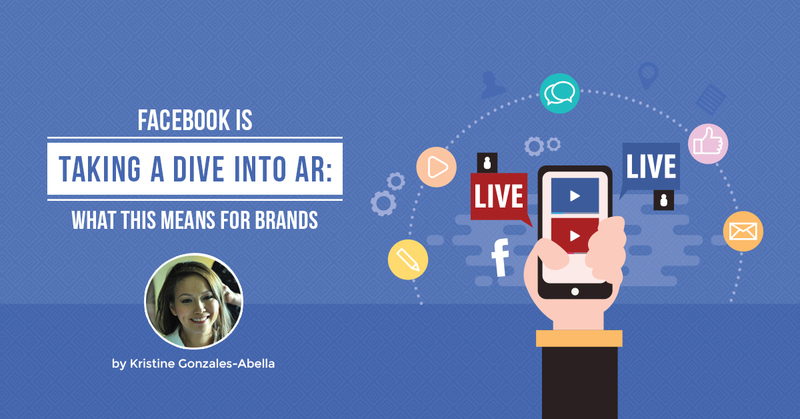 With its AR service, Facebook can attract new audiences while it manages to increase its engagement of the already existing audience base. The ultimate winner then becomes the brands that get to reach new markets that have not traditionally been appealed to by the conventional forms of advertisements.